Worldwide, anthropogenic activities are disturbing and disrupting nutrient rich bio-diverse wetland ecosystems. Disturbance of the South Florida Everglades has been particularly acute, but difficult to quantify given its limited accessibility. Successful ecosystem monitoring requires the use of remote sensing. We used space-based Synthetic Aperture Radar (SAR) observations in the X-, C-, and L-bands to estimate vegetation structure and above-ground biomass and track their changes over time. In order to calibrate the multi-wavelength and multi-polarization SAR observations, we conducted field measurement in three vegetation communities: hammock, pine and cypress. Our ground measurements included both traditional forestry surveys and state-of-the-art Terrestrial Laser Scanning (TLS), a.k.a. ground based LiDAR surveys. A week long TLS survey was conducted in the Everglades National Park in the three calibrations sites using a Leica ScanStation C10 TLS instrument which utilizes a narrow, green (532 nm) laser beam. During this week we collected a total of 29 scans (33 GB of data). The TLS surveys provided centimeter resolution 3-D point clouds of the ground surface and below-canopy vegetation. Initial analysis of the data has provided detailed 3-D estimates of the vegetation structure and above ground biomass. A comparative analysis of the ability of the three bands of SAR to quantify above ground biomass in the different communities is presented. We also determine the essential bands needed to most efficiently estimate biomass. We find that the performance of SAR differs by community types. More rigorous data processing will provide important quantitative measures that will allow careful calibration of the remote sensing SAR data. Figure 1 - TLS LiDAR point cloud of the pines ecosystem site in Everglades National Park. Points are colored by elevation. 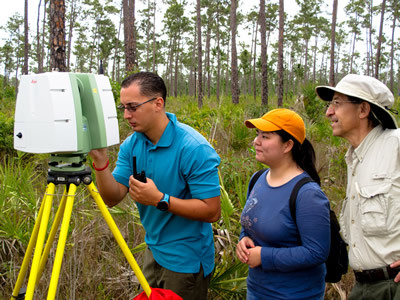 Figure 1 - Emanuelle Feliciano Bonilla and collaborators conducting a TLS survey of the Pines ecosystem in Everglades National Park using UNAVCO�s Leica C10 scanner.